When you first bought your home, it had just enough room for you, your spouse and perhaps a couple of children. However, one thing has lead to another and you have ended up having three little ones (although some days it feels like three dozen). Also, you have been considering moving your ailing mother in with you so that she doesn’t have to live in a home. You are quickly running out of space for everyone and the house is starting to feel a bit cramped. Should you build a house extension, or sell the home and move to a larger property? There are a number of advantages to each option, so here are a few things to consider when deciding whether to expand the house you have or move to a new one. Is Extending The House Possible? Of course, before making your decision you need to figure out whether there is enough extra land around your home to facilitate a home extension. 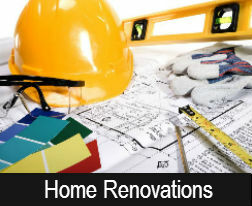 You will also need to obtain the right building permits for the job. You might find that there are limits on building your extension. Will It Improve The Value Of The Home? Most of the time, adding a house extension will add value to your property. However, if you try to cram in an extension where it doesn’t fit you could actually decrease the value of the home. A house with no room for a garden or parking or a disproportionate home could be a lot more difficult to sell in the future. What Are The Property Prices Like Right Now? When making your decision, check in on what the property prices are like at the moment. After doing a bit of research you might figure out that you can afford a home with more square footage for less than it would cost to build your home extension. Don’t forget to factor in closing costs and other expenses, however. When making the decision to extend or move, assess the particular needs of your family so that you can determine what would be the better option for obtaining the extra space you need. If you have any questions about buying or selling property, give your trusted real estate professional a call. You probably had someone check your foundation when you bought the house, but have you looked twice at it since? These problems don’t happen overnight. They start small and they grow. By the time an issue comes to your attention, it might be too late. Learn to recognize the problems while they’re still small and cheap. Your wallet will thank you later. You might be able to tell if your floor is level just by walking on it. Some people have a knack for recognizing this problem. If you suspect your floor of being a bit off balance, grab a tennis ball and see if it stays put. If a door has been scuffing the floor when it swings open, double check the floor. That could be your culprit. A slanted floor can be evidence of a serious structural issue. A shifting foundation can slowly pull apart your house’s frame. Look down your wall from corner to corner and make sure there are not bumps or bulges. Walls should be flat. Grab a level and see if they’re leaning at all as well. Problems with the walls can mean problems with the concrete. Walk around your foundation with a sturdy screwdriver, and poke your foundation firmly. If you can dig a hole in the concrete, that’s a bad sign. It should be firm enough, and dense enough to keep you from causing any damage. Just give it the screwdriver test though. If you start using the jackhammer test, you’ve gone too far. Concrete is always shrinking and expanding. It shrinks with the cold and then spreads back out in the heat. This can cause cracks, and most of these cracks are no big deal. Some of them, however, can be evidence of serious problems. Small hairline cracks between concrete blocks are not a problem. Cracks on areas where the concrete stair-steps down to follow a slope are also not a big deal. They are probably just caused by shrinkage. If you’re worried about one, paint it over with some waterproofing paint, and make sure the crack doesn’t come back. Stair-step cracks on the walls are a bad sign, especially if the wall is bulging. Also look out for horizontal cracks, near the soil. This can mean the moisture in the soil is working into your foundation and putting pressure on the concrete. For problems like these, it’s best to bring in a structural engineer. One of the important aspects of owning a property is having the knowledge of how to keep it maintained to avoid costly repairs and serious damage. Over the years weather and use will wear down both the interior and exterior of your property. If you can catch the infestation right away, it could save you thousands of dollars on repairing future structural damage if it is left untreated. Another important home maintenance task is to go around the exterior of your home and clean out all of the debris from your downspouts and gutters. This will ensure that they are draining properly and moving water away from the house. Otherwise, the water can collect on the roof and cause leaks and damage. 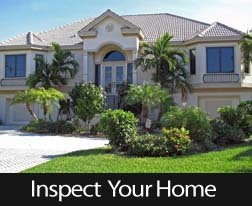 Make sure that you also make a good inspection of the roof at least every six months. Look for any loose shingles or damaged roof tiles. If you spot any damage early, it will be a lot less expensive to fit than the water damage that would be caused in your attic by leaving a leaky roof for a long time. 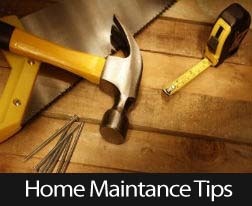 These are just a few of the most important preventative home maintenance tasks that every property owner should know. To learn more, feel free to contact your trusted real estate professional. Having your home broken into is completely violating. Burglars don’t just steal your stuff; they steal your peace of mind. While this is the sort of thing you think will never happen to you, it’s worth the time and effort to make sure you’re not a target. 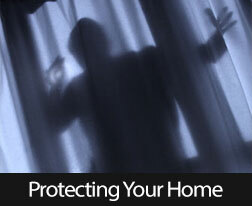 Below are five strategies to help secure your home against a break-in. Purposefully place plants in spots that create a natural barrier to your home. Plant thorny rose bushes in front of bedroom windows and remove overgrown shrubs that provide coverage for creepers. Also, trim back any tree branches that might make an open upstairs window accessible. While a loud alarm might not stop a burglar from quickly grabbing the large flat screen in your living room, it does limit their time for snooping around and finding other valuables. Install an alarm that monitors the entire perimeter of your home. Only give the code to family members and trusted friends. Also, be sure to advertise your alarm system with a sign out front. Not only should these be placed in the front of your home, but also on the sides and in the backyard. Install motion detector floodlights that cover a wide area, and use LED bulbs so that you don’t have to change them as often. Get creative when it comes to hiding your spare key. Seasoned thieves know the common places to look, such as under your doormat, in the mailbox and beneath flowerpots. If you can’t seem to find an obscure spot, then you’re best to leave it with a close neighbor. While we may have the strictest of privacy settings on all of our social media outlets, you never know who your real Facebook friends are — or who’ve they’re talking to. So don’t let all of your friends know over the Internet that you’ve arrived safely in Paris and will see them again in two weeks. The insecurities a robbery creates might even be worse than losing your precious valuables. Follow the precautions above to secure your home and make your possessions less of a target for looters on the lookout.